Thermal paste, thermal grease, CPU grease, heat sink paste, heat paste, thermal interface material, and heat sink compound – They all mean the same. However, its many names don’t confuse us. Its properties do! We all know what we use thermal paste for, right? It used in CPUs for better heat transfer. It does so by filling all the gaps that we may not be able to see with our naked eye. When there are no gaps, the heat transfer is smooth and efficient. This, in turn, improves the performance of the processor. 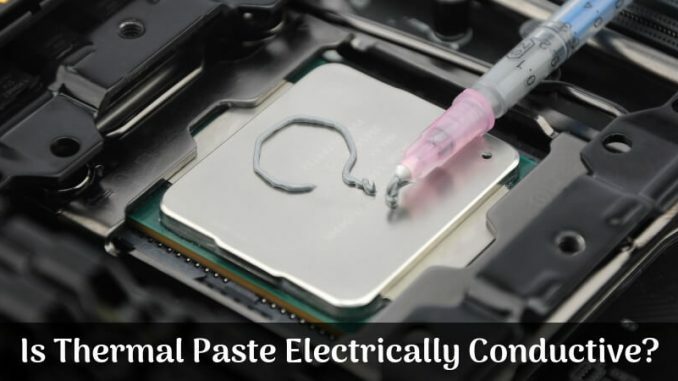 Is Thermal Paste Electrically Conductive? Now, it is quite obvious that thermal paste is conductive thermally because it has to transfer heat but is it electrically conductive? There are conflicting answers here. Usually, a thermal compound can hold a charge. This makes it thermally capacitive. However, it does not conduct electricity. It cannot transfer electricity from one medium to the other. Thus, it is not thermally conductive. Stop here, though. This is not the final answer. Thermal paste conductivity is slightly more complicated than this. The ability to conduct electricity may also depend on what the thermal paste is made up of. A few materials such as silver ice could make it electrically conductive. Carbon-based thermal grease is, of course, an insulator in this regard. Is Cooler Master Thermal Paste Conductive? Cooler Master is a popular brand of thermal paste, and we have heard quite a few queries about it. Let’s put all the confusion to rest now. Cooler Master thermal paste is not conductive electrically. It can only conduct heat. On the other hand, if you take a look at Coollaboratory products, you will find them electrically conductive. We don’t have a definite answer because it depends on the type of material and filler. Most fillers make it insulating, which may make you believe that every type of thermal paste is the same, but there are exceptions like we showcased earlier in the article. Remember, electric conductivity might turn out to be dangerous when it comes to thermal paste because of its usage. Try consulting a professional if you are confused about the heat sink paste that you should purchase. Also, it is not advisable to just slather a lot of thermal paste because it is not conductive. We are dealing with sensitive parts of the system and circuits here. We might as well be careful and follow the instructions. We hope we answered your query. All the best!